The arrival of iOS 5 that among all the news, came with an instant messaging application, IMessage. This application, in the end, I remembered a little inbreeding of BlackBerry Messenger, that is, only the users could enjoy this platform and, if you have friends in the world of IOS, WhatsApp could stop having sense. Thinking is not displaced, WhatsApp has decided to eliminate the only insignificant, a barrier that had in the world iOS: iOS WhatsApp becomes free. 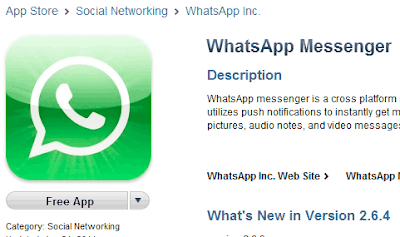 Although WhatsApp is a very popular service, and allows communication between users of multiple platforms, IMessage was a risk for WhatsApp service since it took the same philosophy of BlackBerry Messenger: a totally integrated into the platform to which is added the special to allow communication devices without phone connection (like the iPod and iPhone without 3G modem). While 79 cents is not a very large capital, to have a free system, fully integrated in IOS was a threat that is better not to risk when you can offer, as well as other platforms, your application for free. Click here to download WhatsApp from the AppStore.